К сожалению, не могу сейчас перевести, но новость просто замечательная! Principal photography on the sci-fi action film is set to start in Cardiff next month. Caity Lotz (Mad Men, The Pact) and Toby Stephens (Die Another Day) will play the lead roles in Content Film's romantic sci-fi action thriller The Machine, the company said Thursday. Principal photography is set to start on July 23 in Cardiff, Wales. Content Film is the worldwide film and library sales arm of Content Media Corp. The previously announced project is directed by Caradog James(Little White Lies) and produced by John Giwa-Amu from Red and Black Films. Content’s Jamie Carmichael is executive producing. The film is set in the near future "with the world plunged into another cold war" and Britain’s Ministry of Defense on the verge of developing a robotic soldier, according to the film description. "This soldier, called The Machine (Lotz), looks and sounds human, but has the strength, speed and ruthlessness beyond that of any living person," it says. "The project is near completion when a bug in the programming, a side effect of it being too close to human coding, causes the prototype to destroy the lab and everyone in its path in spectacularly violent fashion." Stephens will play lead scientist Vincent McCarthy who obsessively continues his work on The Machine in secret. Content is selling the film worldwide. Боже, ну до чего же он тут красив!! "Content Film is the worldwide film and library sales arm of Content Media Corporation Ltd., which specializes in high quality and commercial feature films. In addition to handling worldwide sales, marketing, and publicity -- the company assists film producers in securing finance. The Feature Film Library arm also manages international sales on over 240 titles. Content Film is being managed in an executive capacity by Jamie Carmichael, President - Film Division. Content will be in Cannes this year with a slate that includes: The supernatural horror Dark Summer directed by Paul Solet; Mr. Jones starring Sarah Jones and Jon Foster and The Machine starring Caity Lotz and Toby Stephens, both of which made their world premieres in Tribeca;"
На тумблере и в фб выложен постер, и говорят что фильм выйдет на экраны в Штатах и Великобритании, вроде бы осенью..
а я вот больше хочу его пиратом посмотреть: интересно, как у него получится? Тоже с нетерпением жду эти два фильма. В пиратах он будет грубый, а в "Machine", наверное, ....мягкий. Фильм The Machine получила 4 награды на Bafta Wales, из них 3 золотых. ну а фильм-то выйдет когда-нибудь? Здорово! Может и в наших кинотеатрах покажут. siberienne, не знаю..сама уже жду не могу дождаться. что-то пока одни фестивали, призы..
siberienne, все в рамках фестивалей по-моему. 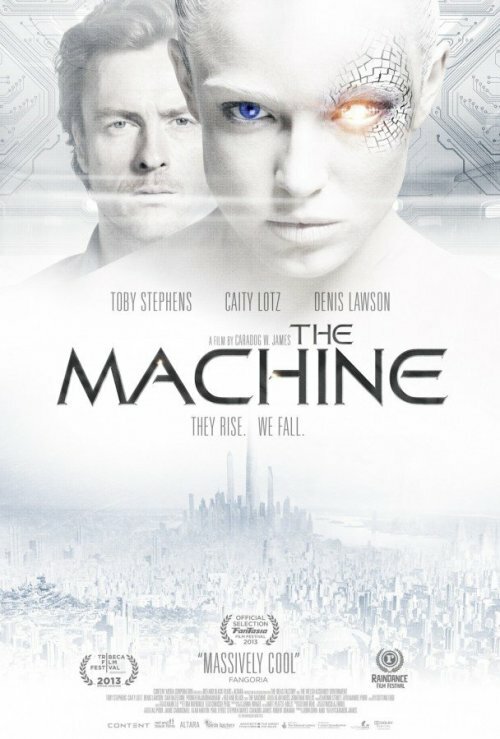 Конференция с актерами и режиссером The Machine на 21th Raindance Film Festival.